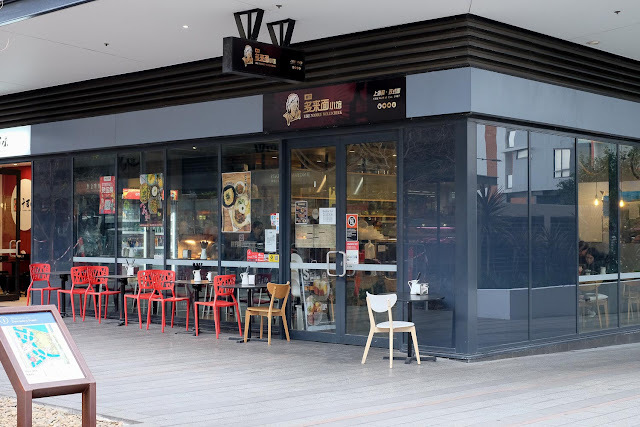 We are fortunate to live within waddling distance of Wolli Creek, there most be close to a dozen good Chinese joints there now, it's like a second Chinatown to us. Like Noodle is our latest Wolli Creek love. It just goes to show how good Chinese food is in Sydney. This joint is fantastic but it doesn't exist as far as food media is concerned. There's just one of those whingey reviews on Zomato and that's about it. Ditto a zillion other little Chinese joints in Sydney. What puzzles us is that folks only get excited about Chinese food in Sydney when it gets yuppified/whitewashed and/or is imported from Melbourne. The irony being that the chefs that make the yuppy food get their food kicks in little low key joints like this all over Sydney. Anyhoo, we've been loitering Like Noodle a fair bit lately. It's a relaxed place with cheery staff, and it's a surprisingly interesting place to watch the world go by. 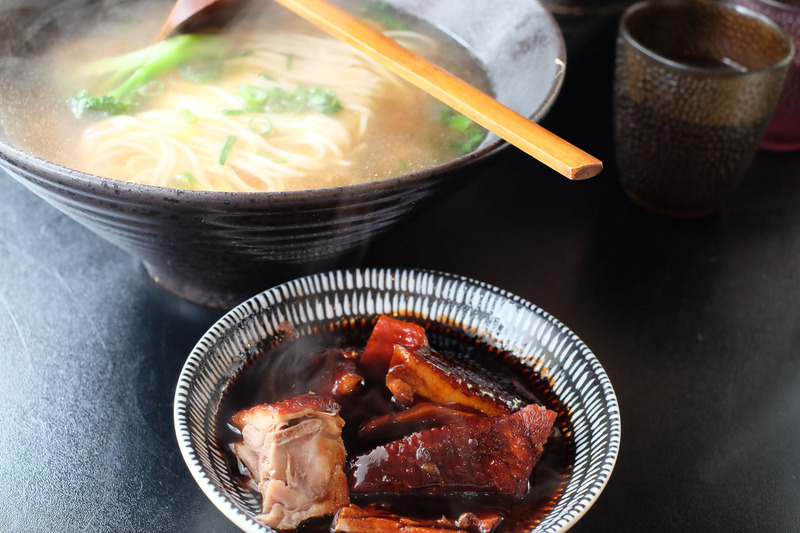 We're enmoured with their noodle soups, of which they have a bit more variety than the nearby also-excellent Shanghai Fried Dumpling. They're all good soups, Brent. 13/10. Diced hot pork in spicy paste - $10.50. Thin noodles - soft with a nice spring. Soup has a star anise zing and is gently chili warm. The pork tastes of sweet Sichuan pepper stir fry. Lifted the spirits on on a beige day. 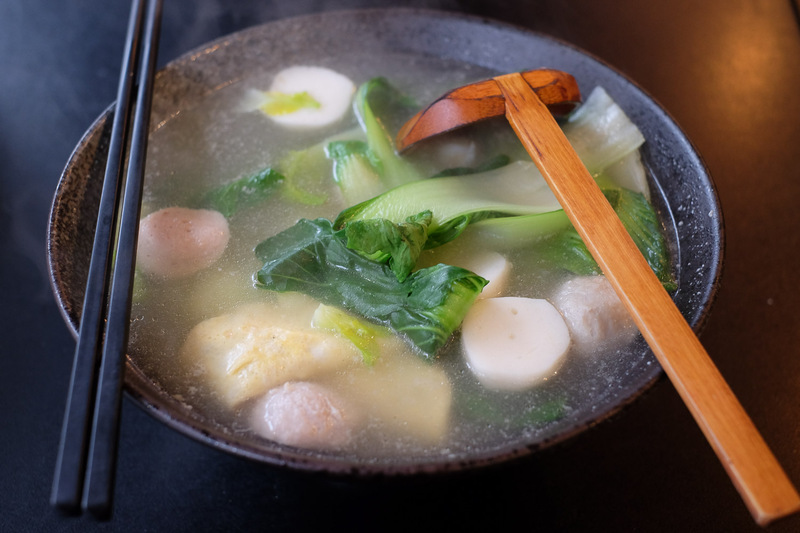 Noodle soup with handmade egg dumpling, fish ball, meat ball and vegetables - $13.80. 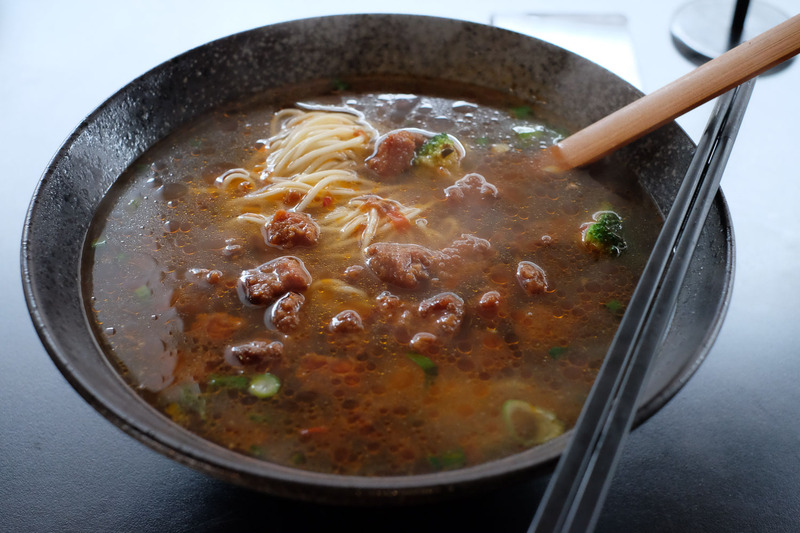 A clear and cleansing broth, with some balls of the very best of mystery meats, and even a couple of bits of prawn. The handmade egg dumpling was worth the admission alone, like a wonton wrapped in omelette. Signature meatball soup - $10.50. 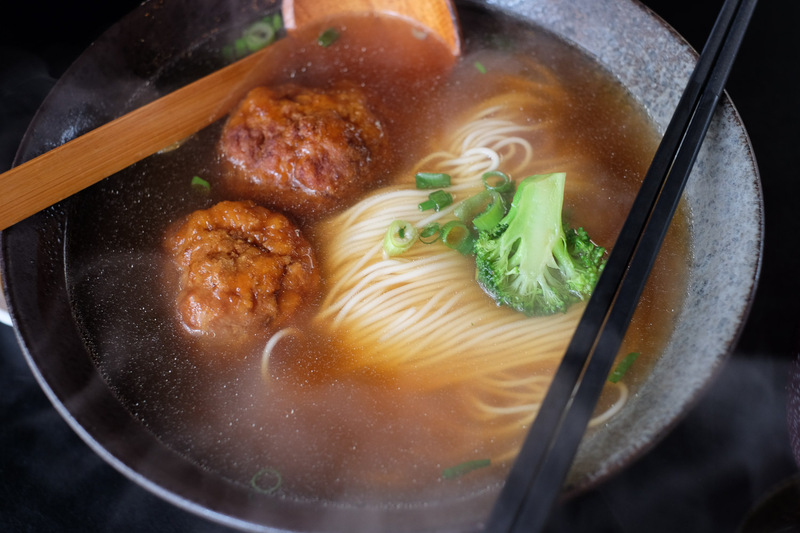 Two fried pork balls - light and almost the size of a tennis ball in a gentle broth. We love rissoles in all forms. Shanghai sweet soy duck noodle soup - $13.80. Oh, that duck in a thick super sweet sauce balanced with a mighty splurgle of soy, it's so good they serve it on the side. We've only had noodle soup at Like Noodle, so we return for a rice dish, to prove we are not rice-ist. We go for the fancier end of the menu - Thirteen spices yabbi meat with rice - $18.80. 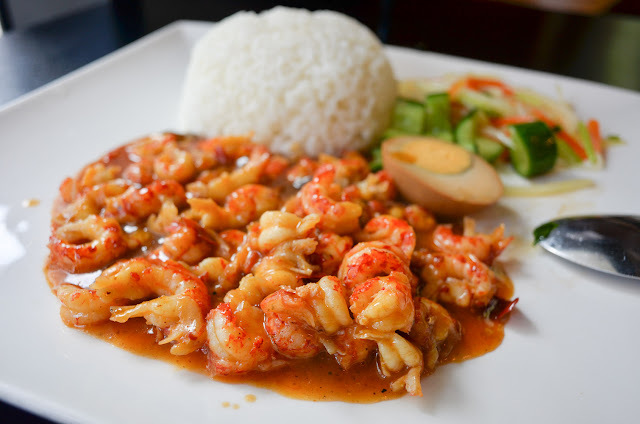 The yabbies are like school prawns, only extra chumpy with a stronger prawny flavour. We give silent hommage to whoever prepped and peeled the yabbies, we've had DIY style in Shanghai, which are a lot of fun but a lot of work and mess. We'll go the easy-eating version anyday. We're not sure what the 13 spices are. Theres chili and blackbean visible, and there a little Sichuan pepper mouth buzz. Who knows what the other nine are. Like Noodle is at 16/5 Brodie Spark Drive, Wolli Creek. Google tells us there's another Like Noodle in Hurstville, where Google also tells us we've already eaten, lucky we took photos. The Wolli Creek branch is busy and it's good, cheap and easy.